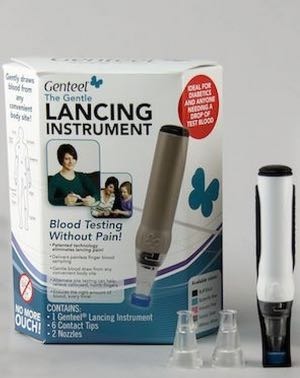 The only painless way for us to check our blood sugar level, the Genteel lancing device, is on sale. But it's only for readers of this article and your friends and family and only through this Friday, December 5. I wrote about it when it first became available in June in this article: "Gentle Testing for Diabetes. " I use it myself and know that it is painless. This morning I happened to look at the company's website and saw that instead of the usual price of $129 it was on sale for $99. This is is the sale price that they had offered to people who read my articles once before. When I saw that this $99 price was good only for this "Cyber Monday," I wrote the company, saying essentially, "great, but I need more notice. " In response, Anita Matthews, the company's customer service and marketing manager, just gave us the notice we need. It comes with free shipping in the U.S., a 120-day money back guarantee, and a choice of five colors. Everyone who has diabetes needs to continue checking his or her blood glucose level. And if you have just been diagnosed and haven't started testing yet, this is the way to begin. Disclosure: I don't own any stock in Genteel or profit in any way. The company did provide me with a device at no cost. I simply believe in this device based on my own experience with it in comparison with the many other lancing devices that came before. Now is a second chance to test your blood sugar painlessly. If you haven't already, please grab this opportunity while you can.